Content - PAR Z100 5K & PAR Z100 3K: The Classic Par Can Receives A New Lease On Life! PAR Z100 5K & PAR Z100 3K: The Classic Par Can Receives A New Lease On Life! Par cans have been a staple of concerts, theatre productions and in-house venue lighting systems for decades. Their look is iconic, but poor efficiency means that they waste a lot of electrical energy by producing excess heat that makes stages uncomfortable for performers. But now ADJ is giving a new lease of life to this lighting classic, by combining a traditional par can casing with a potent and highly efficient LED light-source. The PAR Z100 looks exactly the same as a regular black Par can, but inside its casing is housed a powerful 100W C.O.B. (Chip On Board) LED. Its output is comparable to a 1000W sealed beam Par, but it produces a fraction of the heat. 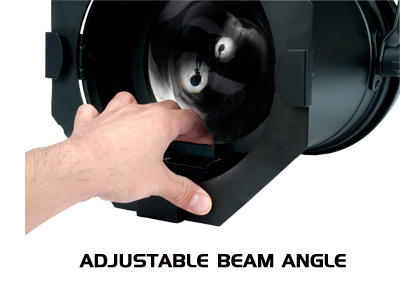 This make it ideal for illuminating stages while ensuring that performers won’t get too hot. Two versions of this innovative new fixture are available. The PAR Z100 3K features a warm white C.O.B. LED with a color temperature of 3000K, which offers a good approximation to the output of a traditional halogen lamp. The PAR Z100 5K is fitted with a cool white C.O.B LED with a color temperature of 5700K, which makes for a starker and more intense beam. Both fixtures offer an adjustable beam angle of 9, 15, 20, 25 or 30-degrees, which can be easily changed using a manual latch system. This makes the Z100 units extremely versatile, suitable for both spotlighting and stage washing duties. They are also supplied with gel frames that can be used to mount color and diffusion filters (sold separately), which adds to the flexibility of this unique fixture. In addition to 0-100% flicker-free dimming, with a choice of five different dimming curves, the PAR Z100 fixtures also offer variable speed strobing up to a maximum frequency of 25Hz. 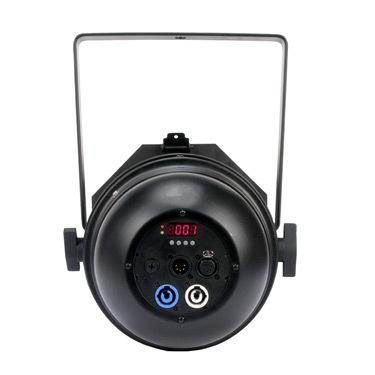 Each unit can be operated using two DMX control channels (one for dimming and one for strobing) and is fitted with professional 5-pin XLR input and output sockets. With a life expectancy rated at 50,000 hours, the COB LED light-sources that power the Z100 fixtures should never need to replaced, no matter how much use they get. This is another significant benefit of these ‘next generation’ Pars, removing the expense of replacement lamps and the worry that one will go part way through an important show! Just like a regular Par can, the Z100s feature an adjustable hanging bracket that can be securely locked into place using two plastic thumb-tightening screws. The fixtures also offer locking PowerCON power input and output connection sockets. And, thanks to their low power draw, up to 15 units can be daisy-chained together at 120V (up to 25 at 230V) from a single mains socket. The PAR Z100 fixtures are the same size and shape as a regular Par can, measuring 19.5” x 10.75” x 10.75” / 491 x 272 x 273mm (LxWxH). They also have the same robust metal construction and each weigh in at a very manageable 7.5 lbs. / 3.4kg. This lightweight, yet strong design makes the units ideal for use on touring productions and one-off events as well as for permanent installation in theatres and concert venues. The PAR Z100 3K and PAR Z100 5K allow lighting and stage designers to achieve the look of traditional Par cans but with the technological conveniences of modern day lighting. With advantages including low power draw, high efficiency, minimal excess heat, no need for dimmer packs, variable beam angle and two color temperature choices, the PAR Z100 fixtures are the ideal professional choice for contemporary Par can use. The PAR Z100 3K and PAR Z100 5K are available now from ADJ.